I am you; I am not you. And as complicated as this. Where or who or what I am not. We have seen where this goes. The us that we are. Who will not be silenced. This Anonymous Letter to Humanity is a Wake Up Call. Please read! I took both of these images years ago, when I was still living in Toronto, and obsessed with the vibrant graffiti and street art culture thriving there (I’m still obsessed, but from a distance!). I eventually compiled the photos into a book that I was thrilled to sell at the amazing, and sadly now-closed, Pages Books & Magazines, on eclectic and hip Queen Street West, not far from much of the city’s best street art. I became deeply immersed in the city through two lenses – that of the street artists themselves, and of my own, through photographing their work. It was a human connection through several layers, but a surprisingly intimate one. There are so many beautiful ways to commune with others, to receive, and give back. The photo I took, below, has stayed with me – haunted me, really – ever since. 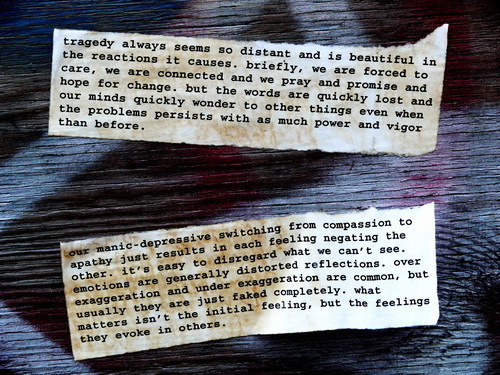 I stumbled on these two small strips of paper, written in a regular-sized font on a simple strips of paper, glued to a piece of wood in an urban back alley. It wouldn’t be the first thing you saw walking along, but I’d been wandering around this neighbourhood for months, and one day these faded, stained pieces of paper caught my eye. The author will remain forever unidentified (though I would love to meet him or her, and have a conversation, and know of the experiences that led to the writing of this letter to the city). In a big city, which to my mind is increasingly a metaphor for the larger, global world we live in, being human often translates into feeling tiny, lost, insignificant. The writer of this plea to the city makes some very prescient comments, alluding to the tendency for our empathy and compassion to come and go as quickly as we’ve now come to experience the updates on our social media newsfeeds in the years since. 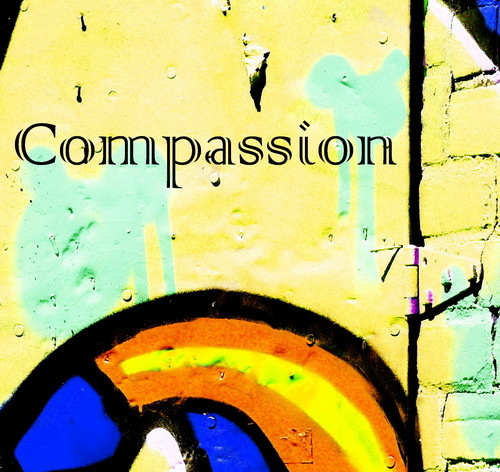 Of course, this isn’t empathy at all, or compassion, because when we have learned to cultivate these qualities, they cease to be fleeting, and we become more able to generate a sustained desire to change the world (and ourselves) for the better. To connect, deeply, gently and kindly. “It’s easy to disregard what we can’t see.” Let’s make a world where it’s not desirable to avoid seeing. Let’s remove the veils behind which apathy and blind eyes flourish. Speaking out from a small slip of paper, this anonymous writer reminds us that it only takes a moment to put something negative in the world, but a lot longer for the effects of this negativity to fade away. We should remember, in reading his or her beautiful, cautionary words, that behind the facades we use through which to communicate with the world (be it art or social media), we are real beings, reaching out to other human beings, who want to love and be loved as much as the next person. Not for what we say or do, not only for right now, under these circumstances and not only to get a “like”, but unconditionally. Equally. This is the beginning and end of what we deserve as we make our way, sometimes fumbling and yes, also dancing our way through the world. In case I never meet this author of these words, I send out a heart full of gratitude for taking the time to formulate these observations and attach them to the urban outdoors, so that we may be duly reminded.